William F. Cody was born in Scott County, Iowa, in 1846. At the age of 14 he began riding for the Pony Express. Then by the time he was 16 years of age the Pony Express was out of business. Following the failure of the Pony Express Cody signed on as a private with the 7th Kansas Regiment of the United States Army. Then after the conclusion of the Civil War, Cody signed on with the 7th Cavalry. At the time the Sioux were straying from their reservation and General Custer wanted them rounded up and brought back. Cody fought in several conflicts with Custer. In 1867, Cody became a buffalo hunter for the Union Pacific Railroad. In the next two years he shot buffalo by the thousands. It was at this time that he earned the nickname Buffalo Bill. Before long, Bill returned to his job as a scout for the army. It was at this time that he met a well known writer named Ned Buntline. For the next few months Buntline followed Bill everywhere while writing down all of his stories. Soon afterward Buntline published his first book “Buffalo Bill: King of the Border Men.” After its initial success he wrote several other books including; “Buffalo Bill and His Daring Adventures in the Romantic Wild West,” “In the Wild West with the King of Scouts,” and “Buffalo Bill: the Buckskin King.” All of the books were poorly written and they always ended with Bill wiping out a band of Indians or defeating outlaws. Soon afterward, Buffalo Bill released several popular autobiographies. The general public believed every word Bill wrote and his popularity skyrocketed. Then once again the army asked him to serve as a scout. This time he worked for General Philip H. Sheridan who made him the equivalent of a colonel. At this time his guide services were in great demand by the rich and famous including Teddy Roosevelt and the Grand Duke Alexis of Russia. These hunting expeditions were usually escorted by the United States Cavalry. Then as his popularity increased, Bill began making personal appearance all over the eastern United States. Then in 1872, General Sheridan made another urgent plea for help. The Sioux were again leaving the reservation in mass and he needed Buffalo Bill to force them to return. Before long Buffalo Bill encountered a group of Sioux that were camped along the Nebraska Loup River. In the shootout that followed Bill killed 5 Indians. For this skirmish he was awarded the Medal of Honor. Shortly after Bill received the Medal of Honor Buntline asked him to appear in a New York play loosely based on his life entitled, “The Scouts of the Prairie, or the Red Deviltry as It Is.” The play was very successful because no one had ever seen anything like it. As a side line Bill continued taking scouting trips, both private and for the army. During this time period he participated in 14 Indian battles. 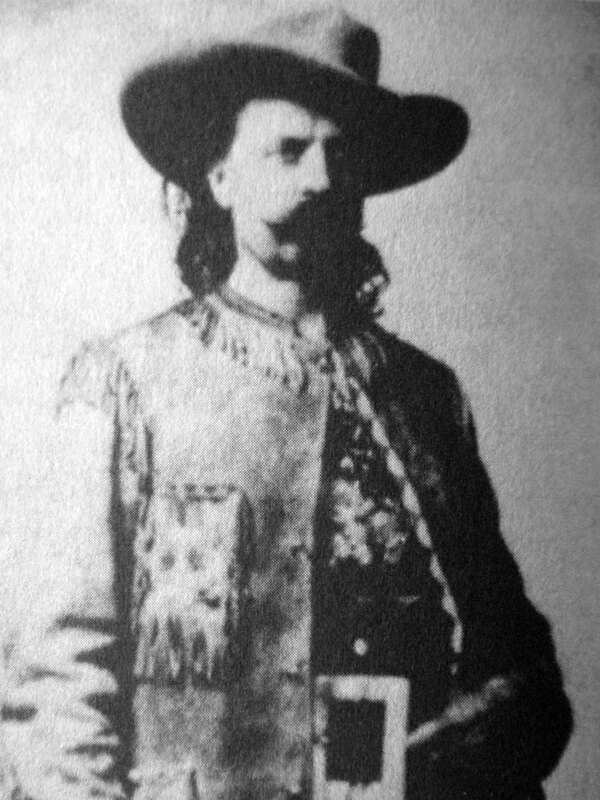 During the winter Bill appeared on stage in what was called the “Buffalo Bill Combination,” which included Pawnee Bill, Cactus Jack, and Wild Bill Hickok. However, Bill wasn't finished. His most famous fight was yet to come, and it was against an Indian named Yellow Hair. The two would accidentally meet on a hilltop and immediately begin exchanging gunfire. Bill luckily emerged the winner. He next staged his famous “Wild West Show” which included the shooting of Annie Oakley and Sitting Bull. He was next invited to Europe by Queen Victoria and various monarchies. His first appearance was attended by 20,000 people. Bill died of prostate cancer on January 10, 1917.